Our current available selection of vintage hand painted cottage furniture can be found on our Etsy Shop. Our creamy white finish will blend with your personal decorating style, and will enhance your romantic cottage, beach cottage, Farmhouse or eclectic home. Perfect for children's bedroom furniture! Feel free to contact us for more information or to discuss your furniture needs. All items are one of a kind. If you don't see the perfect piece you are looking for, we will work personally with you to create the custom piece you are dreaming of! We accept all major credit cards. All finishes are very durable and washable with a soft terry cloth and Windex spray cleaner. To further protect your furniture surfaces, please consider having them topped with cut polished glass. e-mail us with any questions or special needs. If you love Vintage Romantic Victorian Furniture, Shabby Chic style , Simple Beach Cottage Furnishings, Distressed White Painted Furniture, or Romantic Cottage Decor, Welcome! Our furniture is perfectly suited for Children's Bedroom furniture , or to enhance your eclectic English Cottage Home. 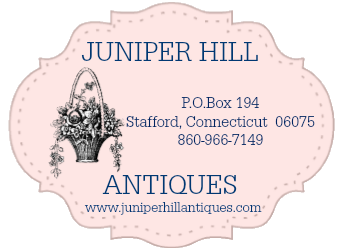 Contact us at Juniper Hill Antiques. *Note* our double beds can be made into queen size with the use of queen extender rails. Click Here for details. If you love Romantic Victorian Furniture, Shabby Chic Furniture, Vintage Distressed White Furniture, Simple Beach Cottage Furnishings, Farmhouse or Romantic Cottage Decor, Welcome! Our furniture is perfect for Children's Bedrooms , or to enhance your eclectic English Cottage Home. All of our vintage dressers are restored to gorgeous condition. All drawers will slide easily and are lined with rose paper, ready to place your pretties in!. All of our furniture is vintage, one- of- a- kind, once an item is sold, we may be able to find something similar, but never exact! Check our Etsy Shop for current stock, we can do a custom Sideboard just for you! Check our Etsy Shop for current stock, we can do a custom desk just for you! What type of mattress will I need for my vintage bed? A currenct selection of King beds can be found on our Etsy Shop. Let us create one just for you! Call us or look on our Etsy Shop, we can work with you to create your perfect nightstand! Check our Etsy Shop for current stock, we can do a custom vanity just for you! A currenct selection of Queen beds can be found on our Etsy Shop. Let us create one just for you! A currenct selection of full/double can be found on our Etsy Shop. Let us create one just for you! A currenct selection of Twin beds can be found on our Etsy Shop. Let us create one or a set just for you! A currenct selection of dressers can be found on our Etsy Shop. Let us create one just for you! Check our Etsy Shop for current stock, we can do a custom Hutch just for you! Check our Etsy Shop for current stock, we can do a custom Armoire just for you! Check our Etsy Shop for current stock, we can do a custom China Cabinet just for you! Check our Etsy Shop for current stock, we can do a custom piece just for you!